The CN435 'Lady Catherine' is electrically identical to the CN434 already mentioned - apart from 3 or 4 minor component value differences. As always, point-to-point wiring is the norm on a steel chassis. the 5" speaker and wooden case give a reasonable tone despite the audio stage being a single DL96 - good only for 200mW at 85V. 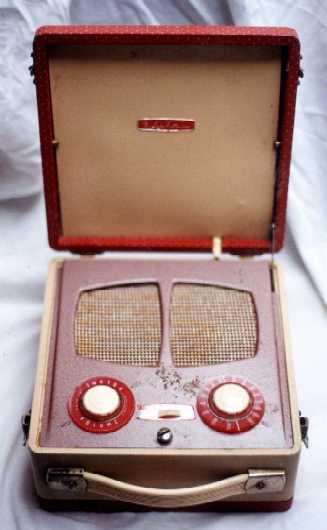 The radio was offered, apparently, in two colour schemes - both shown here. The more common colours seem to have been the pinkish-red and cream, as in the top photo. However, one may wonder if the steel-grey and dark blue scheme (as shown in the lower photo) was Vidor's attempt to market the radio to men! 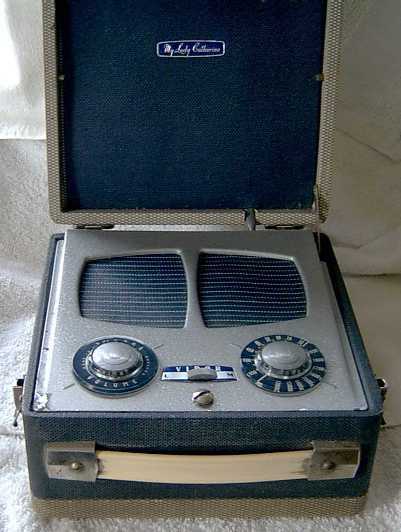 There is no conventional on/off switch as the lid stay operates a switch inside the case, instead of making a 'warning tone' as most other Vidors did.